We can enhance your customer's business image with custom designs for purchase orders, invoices, and other carbonless forms or we can produce forms from a file that you send to us. In addition, we can produce medical or technical forms for specific uses. Need booked carbonless forms? Look no further, we can provide booked forms for you in an efficient and cost effective manner. SEF, Inc., also still provides carbon interleaved forms if your customer requires them. We are a custom shop with the ability to produce paper color sequences outside of the standard White, Canary and Pink. If you need something unique give our customer service a call for pricing. 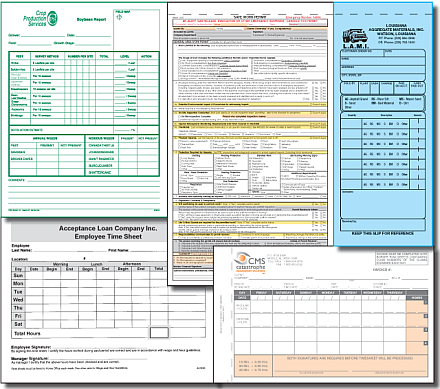 Ask about our affordable full color short run business forms. Color really serves to set your customer apart from the competition. Did you know that you get better prices when you order forms in standard sizes? This dispenses with the need to trim the forms at the knife and therefore saves not only time but also reduces waste. Our standard sizes are shown below. 3 2/3" • 4 1/4" • 5 1/2"
5 2/3" • 7 1/3" • 8 1/2"
11" • 17" • 22"